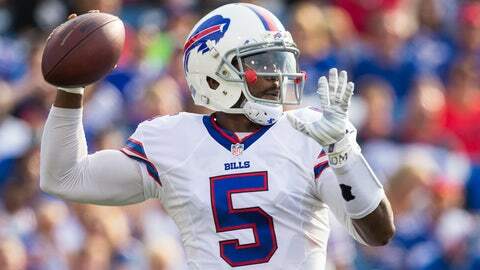 If the Bills make the playoffs this season, it will earn Tyrod Taylor a cool $3 million. The Buffalo Bills took a flier on Tyrod Taylor in the offseason as they had questions at quarterback, but it’s definitely worked out for Rex Ryan thus far. Taylor signed a three-year deal with the Bills in March and beat out Matt Cassel and EJ Manuel in training camp to earn the starting job. Now that he’s the surefire starter, Taylor is on his way to earning big money. According to NFL insider Ian Rapoport, Taylor has incentives worked into his contract that will allow him to earn as much as $3 million if the Bills make the playoffs. Buffalo hasn’t made the postseason since 1999, which is not only the longest drought of any team in the NFL, but the longest of any professional sports team in the U.S., as well. Taylor will make just $750,000 this season, in addition to a $400,000 signing bonus, so a playoff appearance for Buffalo would be big for not only the team, but for Taylor, too. Rapoport is also reporting that if Taylor plays more than 50 percent of the snaps, which he likely will barring injury, the deal goes from a three-year to a two-year contract. Needless to say, the Bills won’t be upset if Taylor remains the starter for the rest of the season, but it will require them to extend his contract sooner rather than later.